Hello my bloggy friends!! Just a quick post today, to humbly ask a favor of you. My most wonderful hubby has entered a contest for a "man cave" makeover. Unfortunately, he didn't find out about it until very recently and the contest ends on Wednesday. If you don't mind... could you please follow this link and simply click the "vote" button. That's all you have to do. No sign ups or anything. We would both be most grateful. He works so hard and puts up with all my girly decorating. He really needs a manly place of his own!! Heading there now. Hope he wins! I voted. Good Luck !! I hope you win. Im back to blogging again. So I can be in touch more. I just put a Halloween post up.Im used to living in the midwest and seeing the colors of fall and leaves on the ground. Im glad they make leaves to decorate with. Just voted, hope he is the winner. Just voted ...my fingers are crossed!! I voted. Hope he wins. Done! Best of luck to him! morkaren har også stemt, mon ikke han vinder, med alt den medvind. knus morkaren. Voted! Can't wait to hear about the winner. Nice to meet you as I've been a follower for a little while but have not had a moment to say hello.... Hello! Voted and I sent the Link to friends for voting too. Best of Luck to him!! 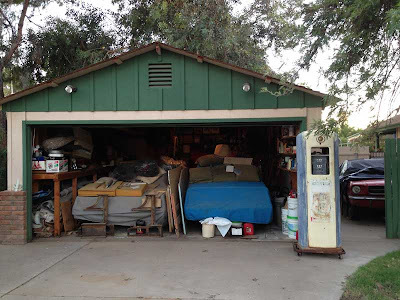 My hubby's Garage Man Cave gets started in the Spring. He felt it was more important to set up my studio first in the New house..Bless their Hearts!! Done! I hope he wins! Voted! I love what he wrote! Always happy to help someone that helps me. I've voted and think he wrote a wonderful piece about his man cave. I voted from France, good luck for him ! I voted for your hubby to win the makeover! Good luck to him! Voted & it was sooo easy! Usually they want all sorts of info when you vote for someone. :) Can we vote tomorrow & Wednesday too? Good luck to your hubby! Hope he wins! I voted also sent the link to friends. I voted! Many of us know what it is like to have a husband who is in need of his own non-girly space, so hope he wins. I voted. I hope he wins. Did it! :):) Hope he wins! Done...hope I did it right...the pic of the garage came up and clicked where it said "vote here". I know your hubby is great because you always comment about his doing this and that for you. Done --- I hope he wins big time! Every guy ought to have their own mancave for sure! Done! Wish him the best of luck! Just voted. Glad I'm helping you. I've been and voted too. My husband has a small bedroom he converted into a fish room man cave. He lives in there. Keeps him from complaining about our girly house. I voted--hope he wins! Just left my vote for you today and will do again tomorrow. Hope you win. Voted! Crossing my fingers he wins! Voted! Enlisted some friends too. Hope he wins! voted again, hope your husband wins. My votes in. Hope he wins. Feel free to visit my blog. Good luck and keep the posts coming. I do enjoy them and thank you for sharing them.